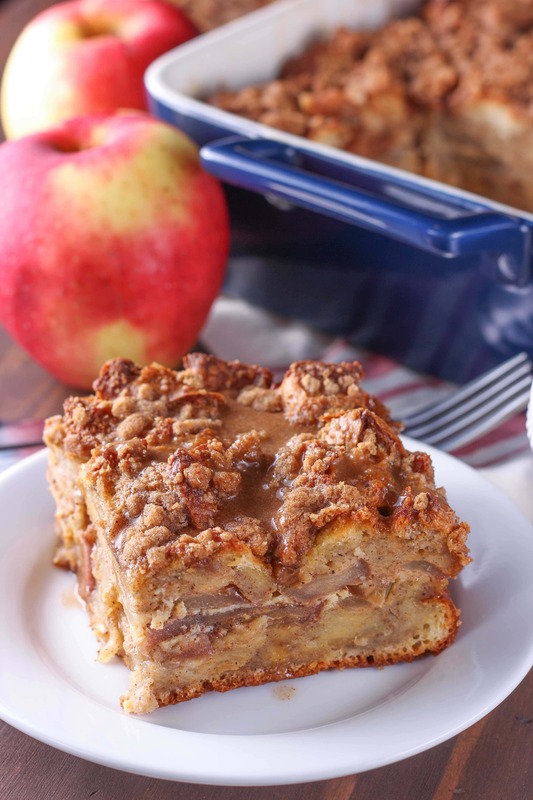 This Spiced Apple Pie French Toast Bake has two layers of spiced bread mixture with a layer in the middle of apples that have been sitting in a mixture of sugar and apple pie spices! Topping the bake is a spiced, buttery streusel! This post is sponsored by SweeTango, however all opinions are my own. Fall is officially here. I know that date-wise it’s been here for awhile. But the weather had been so mild it was hard to believe it was actually fall! However, the cooler weather has arrived to stay, and I feel like I can start digging out sweatshirts, fall candles, and favorite comfort food recipes. I don’t know about your house, but it isn’t just the cooler weather that makes it feel like fall. For us, apple season means fall! We eat so many pounds of apples this time of year! 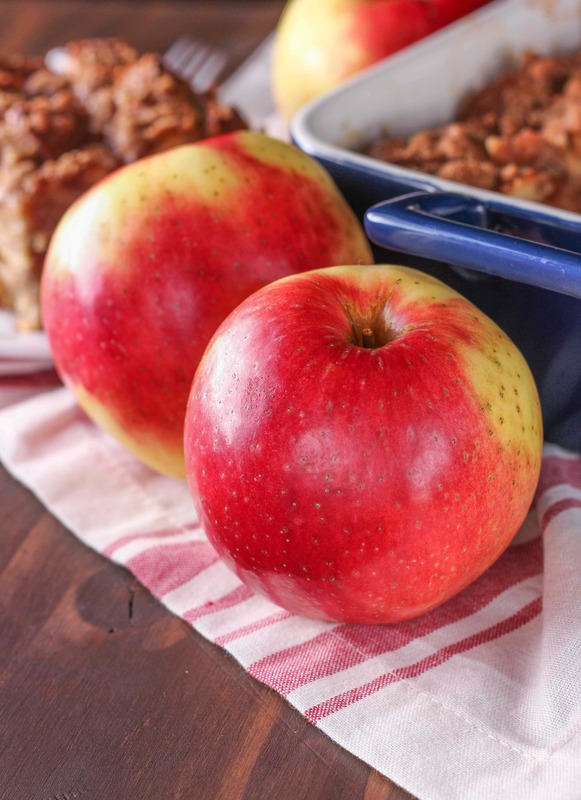 Whether they’re eaten fresh, made into applesauce to freeze and enjoy later in the winter, or used in baked goods, apples are equivalent to fall for us. Even more so than pumpkin. And what apple do we enjoy the most this time of year? SweeTango apples! So, when SweeTango asked me to partner with them again this year, I couldn’t resist! SweeTango apples are a cross between a Zestar! and a Honeycrisp (and were created right here at the University of Minnesota!). If you like Honeycrisp, you’ll love SweeTango apples! They are crunchy and sweet with a hint of citrus, honey, and spice. Great for snacking on and for baking! Oh, and that crunch I mentioned? Fun Fact: It set the world record in 2016 for the “loudest crunch of an apple” in the Guinness Book of World Records! This premium apple variety is available from early September and are usually gone in December. So, that means it’s time right now to take advantage of the season! Just like last year when I made apple pie filled cinnamon twists, I went with another breakfast/brunch recipe. 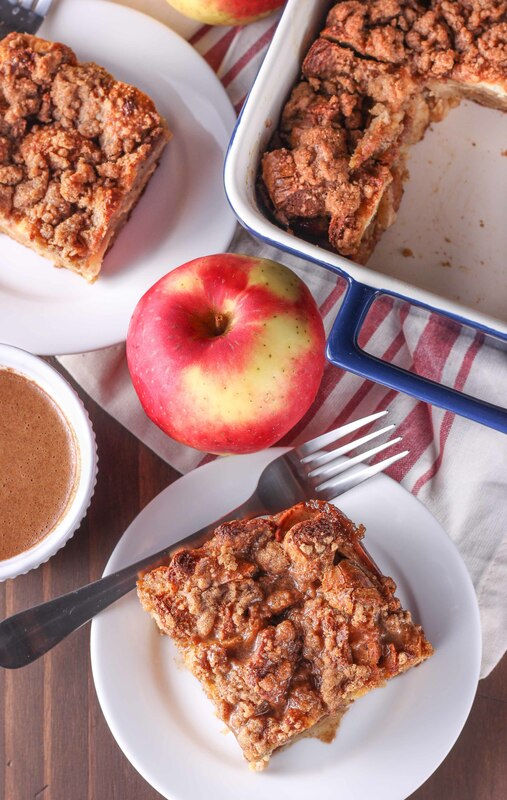 There’s nothing like waking up to a warm, hearty breakfast that’s filled with warm spices, fresh autumn apples, and a sweet, buttery streusel! 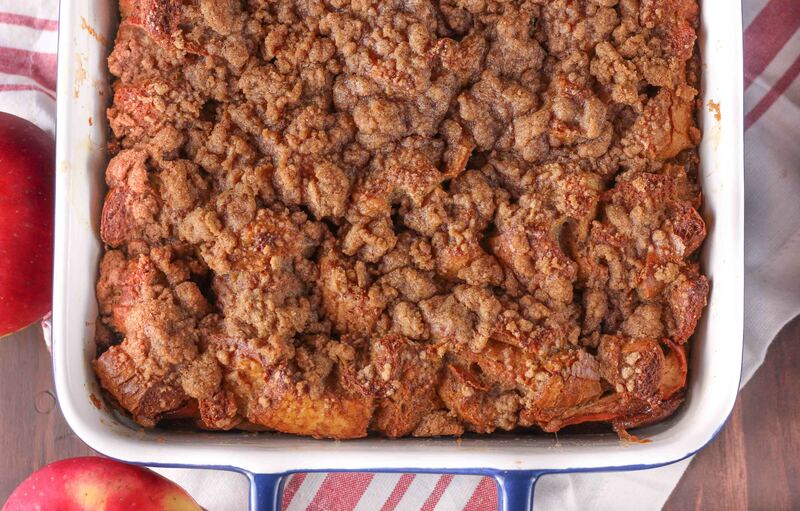 French toast bake has been a favorite at our house for awhile. I like the fact that you can either make it the morning you want it or you can prep it the day before to bake the next morning. Plus, the leftovers taste great. Serve up whatever size you want in the morning. It’s also a convenient option for when you’re leaving the house at different times in the morning! 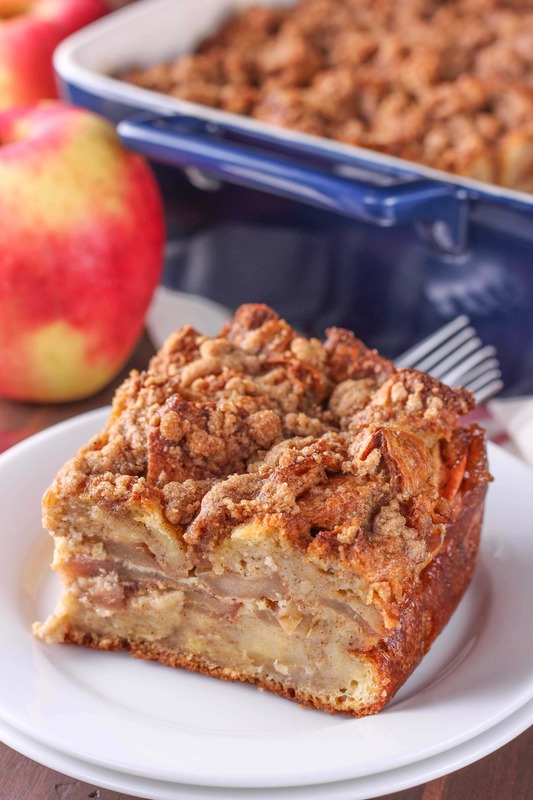 This french toast bake has two layers of spiced bread mixture with a layer of apples in the middle that have been sitting in a mixture of sugar and apple pie spices. Don’t be scared away by the longer list of ingredients! Most of the ingredients are just spices. And those same spices are used for the french toast, the filling, and the topping. Easy! The sweet apple pie spiced topping on this is perfect for adding more apple pie flavor without making it too intense and overpowering. And really, is streusel topping on a baked good ever bad?! Cut yourself a slice, and enjoy your new favorite fall breakfast! Be sure to check out the SweeTango Facebook Page for more apple inspiration! All you have to is comment below letting me know your favorite way to enjoy apples!! Want extra entries? Follow A KITCHEN ADDITION and SWEETANGO on Instagram and come back here and let me know you followed. Add cubed bread to a large bowl. Set aside. In a separate large bowl, whisk together eggs, maple syrup, milk, vanilla extract, cinnamon, and nutmeg. Pour over cubed bread and stir to combine. Stir together apples, sugar, cinnamon, nutmeg, allspice, and cardamom. Pour ½ to ⅔ of bread mixture into the bottom of the prepared baking dish. Using a slotted spoon to scoop apples while straining the excess liquid, spoon apple pie mixture over the top. ** Top with remaining bread mixture. In a small bowl, whisk together brown sugar, flour, cinnamon, nutmeg, allspice, and salt. Cut in butter until mixture resembles coarse crumbs. Sprinkle over the top. If baking the next day, cover and store in refrigerator until ready to bake. If baking immediately, bake for 55-65 minutes or until topping browns and center is puffed. (Center will deflate as it cools.) Allow to cool for 10 minutes before cutting into pieces and serving. While french toast is baking, combine maple syrup, cinnamon, nutmeg, and cloves in a small saucepan and bring to a boil over medium heat. Remove from heat and set aside until ready to use. **You can just spoon the apple mixture over the french toast without straining the excess liquid, but the french toast take will take a few minutes longer to bake and will be on the wetter side. My favorite way to enjoy apples is to spiralize them, toss them in some spices and yogurt, then top with granola. Satisfies sweet cravings and is fun to eat! I’m also following SweeTango on insta! I enjoy apples in cakes and pies. I love apple jam on muffins. apple crisp a la mode! I love caramel apples and apple pie! I’m a HUGE caramel apple lover! I love homemade apple sauce! My favorite way to enjoy apples is as a dessert, like cobbler or pie. My favorite way to eat apples is in apple pie but the easiest way is to cut them in eighths and eat them! I live in the south where apples do not grow so fresh apples are a rare treat. 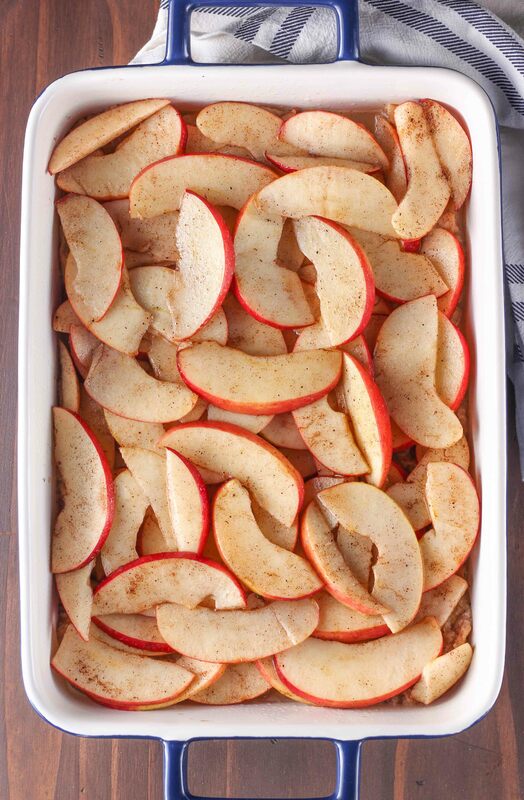 Our favorite way to eat apples is very thinly sliced with the skin . Pure, simple and so delicious! I follow sweetango_apple and akitchenaddiction on Instagram. Making apple crisp is my favorite way to enjoy apples. I bought some Sweet Tango apples just yesterday! They have a wonderful flavor and firm texture. I love snacking on fresh apples, and my favorite dessert is a homemade apple pie with vanilla ice cream. I love apple cake! I look forward to it every fall. Thanks for the chance! i love apples with peanut butter! Apple dumplings are my favorite during the fall season! I love making apple crumble! Caramel Apple Crisp is one of my favorites. I follow you both on Instagram. Oh my word. I want this for dinner! I can’t get enough apples this time of year! This looks super delicious, thank you for sharing the recipe! I have always loved apple pies, perfect for the crisp fall day! I like apple butter great treat in the fall. Apple pies and cakes. This looks super tasty! I bet the entire kitchen smells divine afterward! Do I need to share this with anyone? Because I don’t want to 😀 It looks perfect for brunch with a ginat cup of coffee! I adore this recipe! I am going to make it for Christmas morning! I love the fact that I prepare a day ahead! Oh My Word! This looks amazing. Time to go apple picking! I love to slice fresh apples and saute them simply in a skillet! Goes with breakfast, lunch or dinner! I followed Kitchen Addiction on instagram! I followed SweeTango on instagram! I have apples for breakfast every morning. I make oatmeal and add chopped apples, raisins, pecans, cinnamon, nutmeg and pure maple syrup. I follow SWEETANGO on Instagram with the handle @firerunner2379. I follow you on Instagram with the handle @firerunner2379.